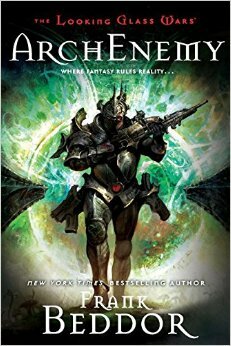 ArchEnemy is the third and final book in the Looking Glass Wars (and I'm glad). I read the first two books a few years back, (as mentioned), but wasn't motivated then to finish the story. In my recent re-reading of the series I felt like reading to the conclusion and, ultimately, I'm glad I did. We recently took a two week trip to South Korea and that's a mighty long plane ride. I was looking for books to take on the Kindle and decided to take the plunge and order this title to read on the flight. ArchEnemy picks up where Seeing Redd takes off. A neighboring king has managed to suppress imagination in Wonderland, thus throwing a wrench in both Alyss and her wicked aunt Redd's schemes to maintain their queendom. Alyss and Redd are in a dead heat to see who will ultimately defeat the other. Throw in the turmoil with the neighboring kingdom and there are more epic battles to be had then ever before. That's about as an exciting description as I can give this book. ArchEnemy needed to be the last book in this series. Please don't get me wrong, I absolutely loved the first title, The Looking Glass Wars (linked to recent review) but the other two titles feel more like a grab towards an action movie to me and after awhile one gets tired of the endless nastiness and battle scenes. I get it already - Redd is a horrible person with the nasty ability to use black imagination to terrorize everyone in sight (and out of sight). Alyss is the struggling brave warrior princess who is learning to govern a queendom. The idea for the characters and the story are both very, very fun but it felt like the books were a progression of longer more intense battle scenes. That's just not my thing. While I'm glad to know how the story "ends" (as far as the trilogy goes) I'm feeling rather done by book three. It's been a long time since I've read any fantasy or adventure books and reading these was something I wanted to do. I feel like I've successfully scratched that itch and am ready to move onto a different genre for awhile. It's fun to dive into an alternative world now and again and read something more unique than my norm and for that reason I'm glad I read The Looking Glass Wars trilogy. By no means do I regret it, but its time to read something else. It's not likely I'm going to ever re-read the entire series of these books, but as I've mentioned, The Looking Glass Wars: Book 1 can stand alone and I can totally see myself pulling that one off the shelf at some point in the future. Frank Beddor had a very compelling, unique storyline to deliver and overall I'd say he delivered well. I'm just not as into battle scenes as he is and so I grew weary way before he did. 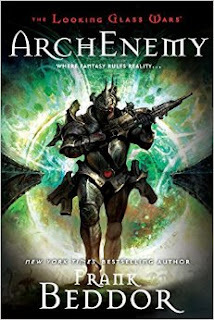 One extra little thought that I had when reading ArchEnemy was that it's very Steampunk. The descriptions of the character's wardrobes and weapons painted a very Steampunk feel in my mind and so if you have a Steampunk friend who likes to read, they might find this story extra compelling. Just a thought! If you ever have a chance to read the first title, The Looking Glass Wars, I'd highly recommend it. The rest of the series is a "take-it-or-leave-it" in my opinion. I adored these books when I read the first two - I think I was 12. But I too, did not read the last book. I was completely obsessed with/in love with Hatter Madigan. Does he still have a strong presence in the last book? Yes, he does. And there's a spin-off series which focuses on him quite exclusively.